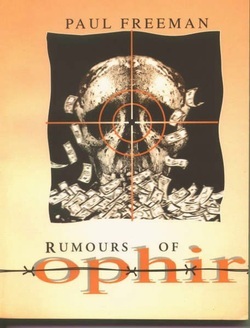 This month Paul Freeman’s crime novel Rumours of Ophir (College Press, Zimbabwe, 1998) is published in German translation as Die Legenden von Ophir (Pulp Master, January, 2005). Q: How did you decide on such an unusual title for your debut novel? A: Well, ‘Ophir’ is the biblical name for King Solomon’s Mines. Various legends place Ophir in Yemen, Ethiopia, the East African coast, and even at Great Zimbabwe, a mysterious citadel in central Zimbabwe. It was the rumours of wealth and fortune that brought the Portuguese to Mozambique and Zimbabwe in the fifteenth and sixteenth centuries. These legends catalyze the action of my novel, hence the title. Q: Why did you choose crime fiction as the genre for your novel? A: If you look at literature from sub-Saharan Africa, it’s almost entirely a record of pre-colonial and post-colonial suffering. I wanted to write a novel that was different to this unremitting diet of misery. Also, prior to the inception of Rumours of Ophir, I worked as a volunteer librarian. With plenty of time for reading on my hands, I became a fan of crime fiction. Q: Which authors inspired you most in writing Rumours of Ophir? A: That’s a tough question. I use quite a bit of metaphor in Rumours, and I think this came from reading Graham Greene. However, it would be unfair of me not to credit Agatha Christie. Her earliest works were set in the Middle East where her husband worked as an archaeologist. Similarly, Rumours is set at a number of Zimbabwe’s archaeological and historical sites. Agatha Christie believed - quite rightly in my view - that archaeology and crime detection have much in common since they both involve searching for and interpreting clues. Q: To what extent do you use historical information in Rumours of Ophir? 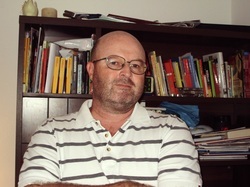 A: The backdrop to the story is incidents that occurred during a period of Portuguese influence in Zimbabwe. I use historical fact and educated suppositions as vehicles to propel the action forward. On another level, Rumours has a historical context in that I wrote the book fifteen years after Zimbabwean independence and five years before the controversial land seizures began that have completely altered the face of Zimbabwe. My book is set during what was admittedly a time of hardship, but also a period of great optimism over the future. The economic and political situation in Zimbabwe since then has eroded much of that optimism and increased people’s hardship. In this respect, although Rumours chronicles a relatively modern era in Zimbabwe, it is already part of the country’s history. Q: We hear that authors should write about what they know. How much are the people and places in Rumours of Ophir based on people and places you know? A: The main protagonist in Rumours is James Carter, a thirty-something white man. Not unsurprisingly, I drew upon my own time and experience in Zimbabwe for this character. On whether characters other than James Carter are based on real people, all I can say is that since I was living in a small, mining community surrounded by farmland, several characters in the book may exhibit a blend of features, traits and characteristics of people I knew. As far as places depicted in Rumours goes, much of the novel takes place around the fictional Mashumba Valley. This is loosely based on Mazowe Valley, a rural area forty kilometers north of Harare. The capital’s main bus terminal, and the seedy Avenues area of Harare that appear in my novel also exist in real life. If anything, they are grimmer places than I describe in Rumours. The Queen Victoria Museum and the National Archives are also both real places, although the museum has since been renamed and given a less colonial-sounding name. Q: How did Rumours of Ophir come to be published in German translation? A: Well, fast-forwarding from 1998 to 2003, and Lady Luck popped up in the form of Stephanie Neumann, a German PhD student who was in Zimbabwe researching how African women are portrayed in African literature. Quite by chance she picked up Rumours at the Harare Book Fair. Later, when she returned to Germany, she passed my book on to her friend Frank Nowatzki, the owner of Pulp Master, a publishing house specialising in crime fiction in German translation. After contacting College Press, Frank got word to me that he was interested in publishing Rumours of Ophir. 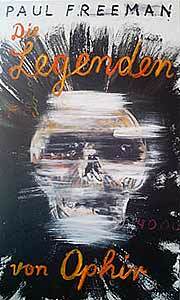 A deal was struck with all parties involved, and Pulp Master secured permission to publish Rumours in German. Q: Are you still writing, and if so, what are your future plans? A: When College Press approached me with their proposal for publishing Rumours of Ophir, this was the impetus for me to take up writing more seriously. Since the publication of Rumours I have done some freelance journalism, written two children’s books, and have a trilogy of crime novels slated for publication in German translation by Pulp Master. In the meantime, I’m taking a break from novels and concentrating on writing short stories. I’m also working on an ambitious Canterbury Tales project, which in effect involves writing short stories in narrative poetry. Q: Will you ever write a sequel to Rumours of Ophir? A: That’s a good question. I think that to write a novel that’s set in a specific country, you must actually live in that country. I’ve been away from Zimbabwe for a long time and have moved on in my life. So although I write the occasional short story set in southern Africa, I’m afraid that Rumours will probably remain a stand alone novel, not part of a series. But who knows? If a good story plot comes to mind I might well be persuaded to resurrect James Carter at some time in the future.